Gabe Newell says it's up to Valve to bring EA back into the fold by convincing the company that it's smarter to be on Steam. Everybody has an opinion about the spat between Valve and Electronic Arts over the distribution of EA releases on Steam. Some people blame EA for hosing Steam users as it attempts to launch its competing Origin service, while others point the finger at Valve's inflexible DLC policies. But Valve boss Gabe Newell says it's actually "a whole complicated set of issues" that have come between the two gaming giants and, more to the point, it's up to Valve to bring EA back. 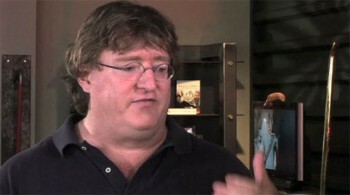 "I don't think Valve can pick just one thing and think the issue would go away if we fixed that," Newell told Develop. "We have to show EA it's a smart decision to have EA games on Steam, and we're going to try to show them that." "The same thing is true of Steam. We have to prove we are creating value on an ongoing basis, whether it's to EA or Ubisoft or whoever." Game companies have to "earn the right" to install their content on their customer's PCs, Newell explained, and Valve has to do the essentially the same thing with game publishers by demonstrating the value of selling their games on Steam. "We want EA's games on Steam and we have to show them that's a smart thing to do," he said. "I think at the end of the day we're going to prove to Electronic Arts they have happier customers, a higher quality service, and will make more money if they have their titles on Steam. It's our duty to demonstrate that to them. We don't have a natural right to publish their games."